Since becoming an adjunct English professor, I've learned a lot from my students about writing. I've been even luckier to work with a diverse group of students for each of my classes, who come from all walks of life, and all parts of the world. Variety enriches experiences, and my students have helped me reexamine and confirm why I love the English language enough to have studied it for most of my life. Some of my favorite students to work with are students whose second language is English. Non-native speakers have to prioritize words and meanings to understand an unfamiliar language. The extra effort that goes into comprehension is also expressed with speaking and writing. And it's the writing that I love. Some of the cleanest, mechanically correct writing comes from ESL students who have learned that words carry weight, and to choose them accordingly. Not all writers can do this. My students don't realize what a wonderful skill this is to have. My ESL students beat themselves up because they think their writing doesn't sound brilliant or intelligent because their language or vocabulary is sparse. Even my native-speaking English students are frustrated that they aren't producing papers that are comparable to Pulitzer-prize winning novels. They can't see that they are good writers, even as they make mistakes. Somewhere along the line, a strange belief manifested among the masses --this idea that you are not a real writer unless you were born with the talent for it, and even then, you are not a real writer if you do not have an exquisite grasp of the English language. If thou art not Shakespeare, dost thou truly write? Before I started my grammar review day during the first week of class, I gave a brief introduction to the English language. It disturbs me that this information isn't widely circulated in schools--that English is German and French and Latin smooshed together with words we've culturally appropriated over the centuries. The history of the English language, in a way, is a great chunk of the history of Britain, and of the Norse, Saxons, Romans, and Normans who invaded. I told my students, "We are speaking the language of the conquerors and conquered." If anyone has ever wondered why English is so difficult to understand, and why rules and spellings seem fundamentally insane, remember, we are clinging to grammar and pronunciation rules we've acquired over thousands of years from various tribes scattered over various eras. On top of that, language evolves. Rules are broken. Old words are given new meanings. Superfluous, redundant words die out. Ultimately, the masses decide what stays and what goes in terms of language, even if publishers and academics have a hand in that, too. This is a major reason why I don't come down too hard on grammar when I teach English Composition. I'm from the school of belief that insists the best way to learn grammar is through reading and writing, because that's how we see language changes in action. It's how we can see the application of grammar in its practical form. Grammar is imperative because it provides structure for a language in order for it to be understood. Why should it be more complicated than that? Of course, language is historically complicated...once upon a time, your grasp of language determined your social class and livelihood. In just a few words, you could determine whether or not someone was an uneducated plebeian or a member of the Tudor dynasty (Henry VIII and Elizabeth I were both quite the writers in their day). Nowadays, the lines between the educated elite and vulgar rabble are blurred. Education is considered a universal right. Education belongs to everyone, and in case you didn't know, English belongs to everyone. Ideally, the playing field is leveled. It does not matter where you come from or who you are, odds are, English is a part of your life in some way. You are entitled to learn the language, to make mistakes as you learn it, to sound horrible, to sound beautiful, whatever. What matters is that you are able to communicate your idea, and that whoever reads or listens will understand you. Yet it seems like there's been a resurgence in grammar snobbery. Or perhaps English is a language that is inherently snobby, but we've only now noticed it because of improved literacy, or through the connectivity of the internet. That's it! I'm blaming the internet! 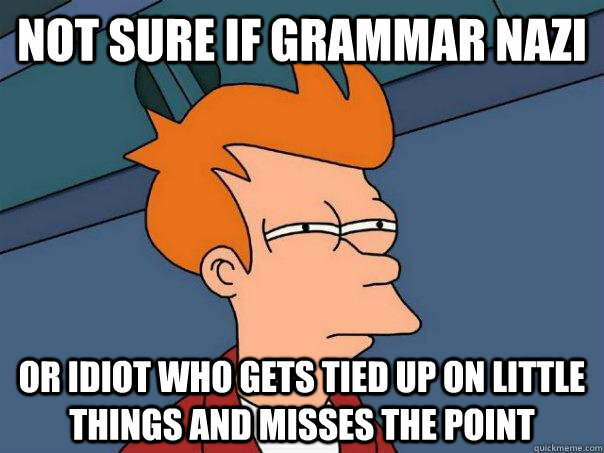 *Sigh* Grammar Nazis. Don't get me started. The internet is a cesspool for them. Let's be clear: Grammar Nazis are not out to help people. They are not pointing out your mistakes because they care about you. They use grammar as a weapon--they revert back to Ye Olden Tymes and hope that their superior intellect is evident when they tear apart your misuse of punctuation and terrible spelling. They believe they are the Vetus Latina and you are the Vulgate. They believe that because they know that it's poor form to end a sentence with a preposition (which is also a rule that is changing), your argument is invalid. As someone who loves to create via the English language, yes, I can't help but shudder when I see typos, spelling mistakes, or even deliberately-written phrases like Cheezburger LULZ. It hurts even more to see it pop up in published books or professional publications. But I know to keep my mouth shut. First of all, we're only human. Second, I've made the English language my profession. I am required to know it intimately and be an example to others when it comes to its usage. This does not allow me to tear down others, though. My personal experience is not the case for a lot of people--everyone has a different story when it comes to what they know about English. Everyone has a different way of communicating, with the initial and perhaps most necessary goal of being understood. According to the British Council, 1 in 4 people ON THE PLANET speak English in some shape or form. Perhaps more importantly, there are more non-native English speakers than there are native speakers in the world. Does your sentence make sense? Is it easy to read and understand? Does it sound good to you when you read it out loud? Does it sound good to your audience? Did you make your point? If you accomplished the above, you are awesome in my eyes.